The general indexes like Nasdaq 100 and SPX stage a recovery yesterday as the indexes hit congestion area support. Things look pretty interesting as the index forms bullish reversal patterns. The question now is the indexes strong enough to have a follow through to the bullish reversal patterns. Let us examine the futures charts of various indexes and see what we can learn from them and what they are telling us. Those who take a look at the futures can sometimes spot early reversal patterns or continuation patterns than those who only look at EOD index data. For past May daily stock market analysis click here. SPX futures were hitting congestion support area in the daily charts. So what I am looking for is for any nice and clean beautiful bullish reversal pattern. So yesterday we drew a downtrendline in the 60 min chart of SPX futures and the first signs of strength is that SPX broke above the downtrendline. It tried to move higher but then dropped a bit which now I'm trying to see if it can form a nice reverse head and shoulders bottom in the 60 min charts. Any follow through will most probably send the index higher up to resistance area of around 2385. Nasdaq 100 is much stronger than the SPX or Dow. It formed a double bottom and the divergence in the MACD was clear to see. And this resulted in a nice move upwards and bull run for tech stocks. 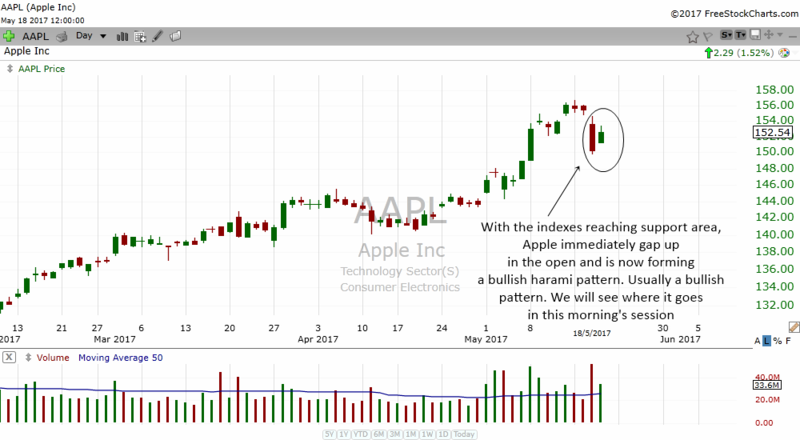 Apple is one of the beneficiaries along with many other tech stocks that gave day traders a really nice long trade to the upside. What Nasdaq 100 looks like it is forming is a cup and handle pattern in the 60 min chart. A break above the handle will bring it higher while a break below will send in back below. Hopefully it break above the handle and at the same time break a downtrendline that I have drawn. This will be a sign of strength and hopefully send the other indexes higher as well. When one market shines, the other market gets hammered. The bottoming of Gold in the 60 min chart tells us that something is going to happen to Dow and the other indexes. And true enough the Dow collapsed the past few days while gold outperformed and shine. Investors tend to run to the safety haven of gold when things are not doing well with the indexes or if the smell that something scary is going on in the indexes which in our case is the "Trump" fear. Gold seem to have hit a short term top at the moment when it hit resistance in the 60 min chart. We could now draw an uptrendline and if Gold drops below this uptrendline, it is most likely it will send the major indexes higher. Gold/silver and major indexes like Dow move inverse to each other most of the time. When Dow rises, gold usually falls and vice versa. Oil was just moving sideways in the 60 min charts these past few days after such a nice bull run. It was actually absorbing supply on the left. The fierce battle as it absorb the supply shows that the bulls are currently in control as it broke out of the box or trading range. Traders might start to pile in oil again with a stop below. It it moves higher and breaksout further, oil prices will slowly climb up in the short term. In the daily chart of oil we can see such a big rollercoaster happening in the price of oil. Volatility as they say is a trader's weapon to profit from the market. A big drop followed by a long bottoming tail marked the end of the bear run in oil. When we see a bottoming tail especially a very long one, we should really respect it and try to see if any reversal is about to happen to oil. Similarly we should also respect a long topping tail. You can see the effect of these two powerful candlestick patterns in the daily chart of oil above. To learn more about these two patterns, read The Bottoming Tail Reversal Candlestick Pattern and Topping Tail Candlestick Pattern. Lets take a look at Apple. Yesterday as the Nasdaq 100 formed a bottoming pattern in the 60 min chart, Apple gapped up at the opening and quickly formed a bullish harami pattern. We will have to see if there is any follow through to this pattern by seeing if it can go above the highs of this pattern. 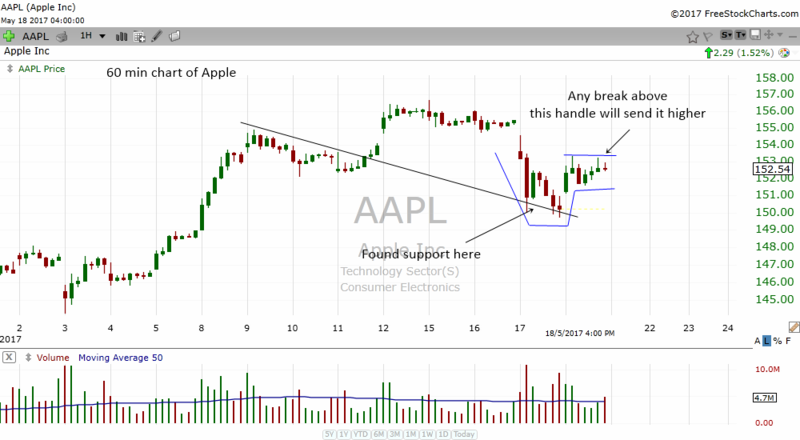 When it does, most likely Apple will move higher. 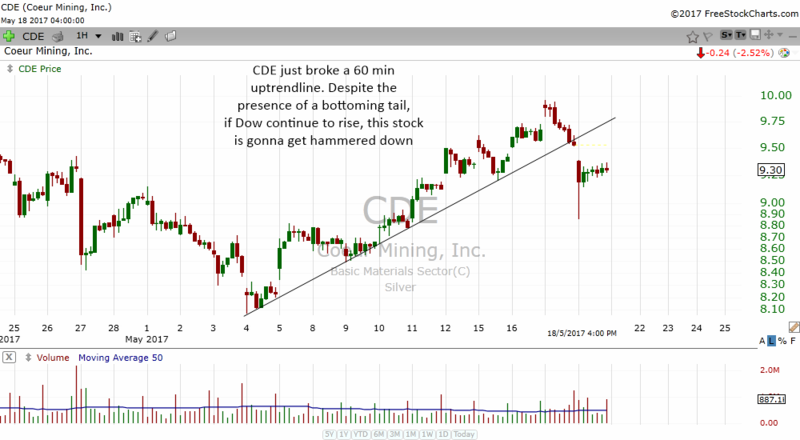 In the smaller time frame of 60 min, we can see how Apple found support at the trendline. In the 5 min chart not shown, Apple actually formed a double bottom. So when it gapped up, traders were buying it all the way up for a nice day trade. Now it looks like is is forming a 60 min cup and handle pattern. A break above will be bullish while a break below will be bearish. Traders react and they do not predict. 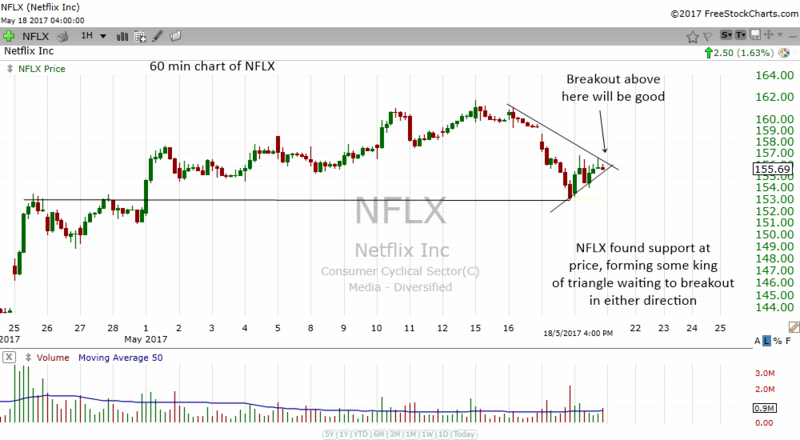 Netflix's 60 min chart shows that is found support at price congestion on the left. It is trying very hard to form somekind of a triangle. And with triangles, a breakout above will be bullish while a breakdown below will be bearish. Will be looking at this carefully. The Brazilian stock market which was on the rise suffered an even bigger drop than the Dow. Imagine all the traders and investors who were long Brazilian stocks. That is why money management is very important. Currently the KLCI mimics the performance of the Dow. With global volatility, what the Dow does, the KLCI will do at this time. So, yesterday when the Dow rose, KLCI also rose along with it today. The KLCI was able to open higher but towards the end of the day, the index drifted lower. But at least it was able to break a trendline. If the Dow rises another day, most likely KLCI will rise along with it next week. Despite all the recent volatility, the Malaysian stock market is still in a longer term bull market. Bursa Malaysia is forming a very nice consolidation at support pattern which if it breaks out of will send the stock higher. The heavy spike of volume shows buying interest in the stock and usually with a raging bull market in Malaysia, the stock will most likely rise because of the increasing profits that it gets from investors and traders who are once again in love with Malaysian stocks. In the longer term picture of the monthly chart of Bursa Malaysia, this stock is forming an extremely bullish pattern that might offer investors a very good risk reward in the long run. The stock is actually forming a monthly ascending triangle which is is starting to break out from. 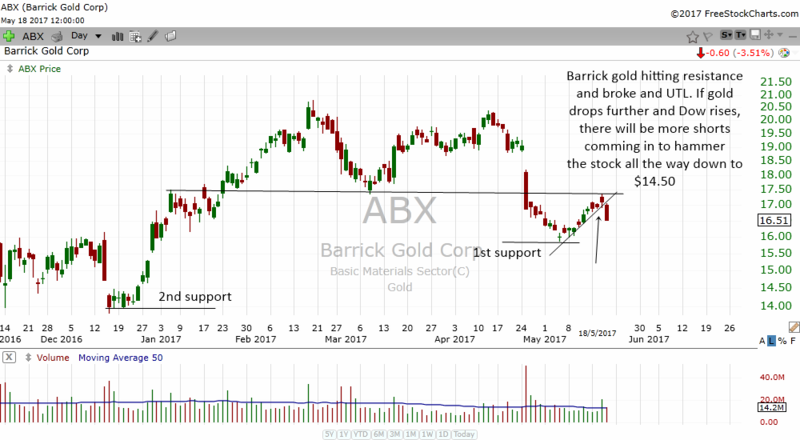 From a technical analysis point of view, a breakout from a long term pattern is very powerful and will give investors a lot of room to run in the stock. With lots of support below and a very large tradeable void above, the path of least resistance for investors is still upside for this stock. Assuming it can go back above to around 16.00 the former high, this stock is actually offering a very good risk reward to investors. As we can see from the monthly long term chart of Nasdaq Exchange and Nasdaq Composite Index, when the stock market is doing well, people will tend to trade more and invest more. This in turn generate lots of profits for exchanges and this will result in increasing stock prices. Look at how NDAQ broke out of a monthly box in 2013 and short higher as the US stock market also shot higher. The stock has more than doubled since the monthly breakout. Whether it is Malaysian stocks or Indonesian stocks or Chinese stocks or stocks listed in the NYSE they all exhibit the same chart patterns of greed and fear of individual market participants. Therefore, a person who is well versed in technical analysis and learn to read the emotions of market participants in the charts will be able to navigate any market in the world.